By Alejandro Rodriguez. Last revised March 3, 2019. Q: I always get a black screen! Q: I get 'Recompile block too large' error! Q: I keep getting 'ePSXe.exe has stopped working'! Q: My game is running way too fast! Q: My game keeps freezing! Q: When I close ePSXe it doesn't close completely! Q: I'm getting a “zlib.dll is missing” error! Q: How can I use GME saves with ePSXe? Q: ePSXe doesn't enter fullscreen! It centers the window instead! Q: Can I transfer my memory card file to another PSX emulator? Q: ePSXe isn't saving anything! *If you would like to download ePSXe, I have it in my emulators page. ePSXe is a standalone program so it does not have an install wizard. Installation is simple: just extract ePSXe from its zip file. Not sure how to extract zip files? Here's a video tutorial showing you how: how to unzip files on Windows. IMPORTANT! 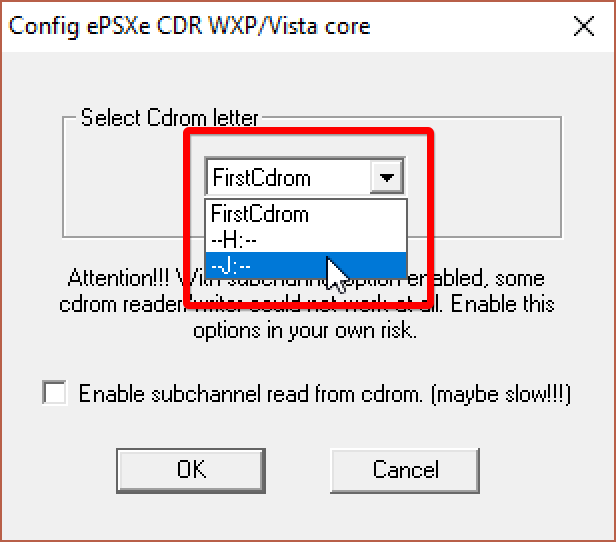 ePSXe must be placed in a common folder on your computer. I recommend Documents, Downloads, or create a folder on your desktop. If you place ePSXe somewhere else on your main C drive, then you may be restricting it to read-only access. This prevents ePSXe from saving anything. They need to be set up the first time you open ePSXe. Each plug-in comes with a whole bunch of useful customizable features. You can download the PlayStation plug-ins from any major emulation site. If you don't feel like looking around, you can just download them below. The PlayStation 1 BIOS is required in order to boot games. This is a separate download after you've downloaded ePSXe. Below you can download this BIOS as well as a collection of the best plug-ins. PlayStation 1 BIOS (236 KB). Download by right-clicking link and go to Save Link As. When saving, rename the “_ip” file extension to “zip”. If you don't see the file extension, try showing them. cdrPeops.dll - This is the CD-ROM plug-in. CD-ROM drives aren't really used anymore so this plug-in is optional. DFSound.dll (Recommended!) - This is the best audio plug-in. gpuPeopsSoft - This is a video plug-in. This plug-in is ideal for people with slower/older computers. 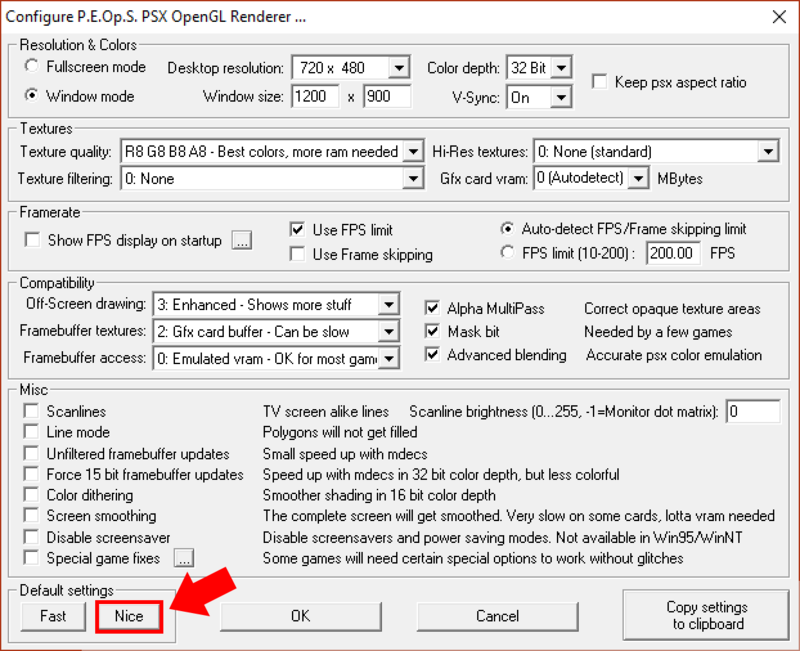 gpuPeteD3D.dll, gpuPeteDX6D3D.dll, gpuPeteOpenGL.dll, gpuPeteOpenGL2.dll - These are the video plug-ins that render the 3D graphics according to a specified resolution (as explained in About ePSXe). Pete's OpenGL plug-in is the best of this trio. gpuPeopsOpenGL.dll (Recommended!) - Same as the above plug-ins, except this is the best and most advanced plug-in. spuEternal.dll - This is the second best audio plug-in. It's friendlier for slower/older computers. spuEternalL.dll - This is just a supporting file for spuEternal.dll. Continue reading below for what to do next after you download the BIOS and these plug-ins. After you download the BIOS and plug-ins, extract them from their zip files. Organize them into ePSXe's folder as shown above. 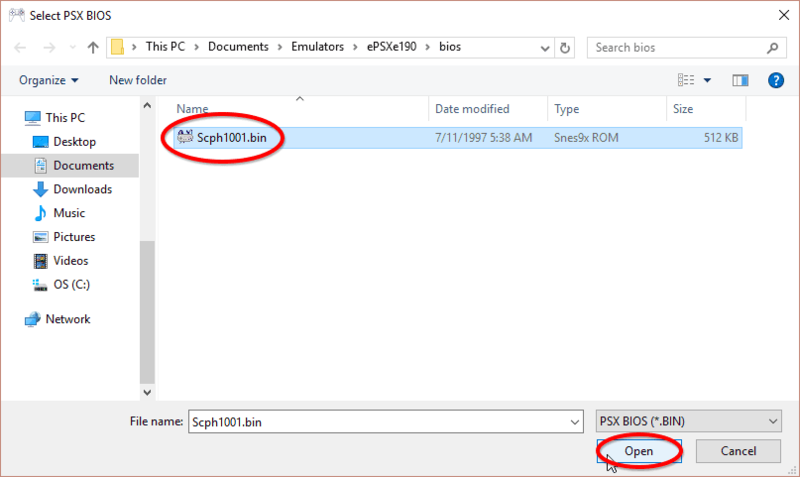 Move the PlayStation 1 BIOS (“Scph1001.bin”) into the “bios” folder. Then move the plug-ins into the “plug-ins” folder. Go to Config > Bios, as shown here . You'll arrive at the “Config Bios” window. Click on the Select button, as shown here . 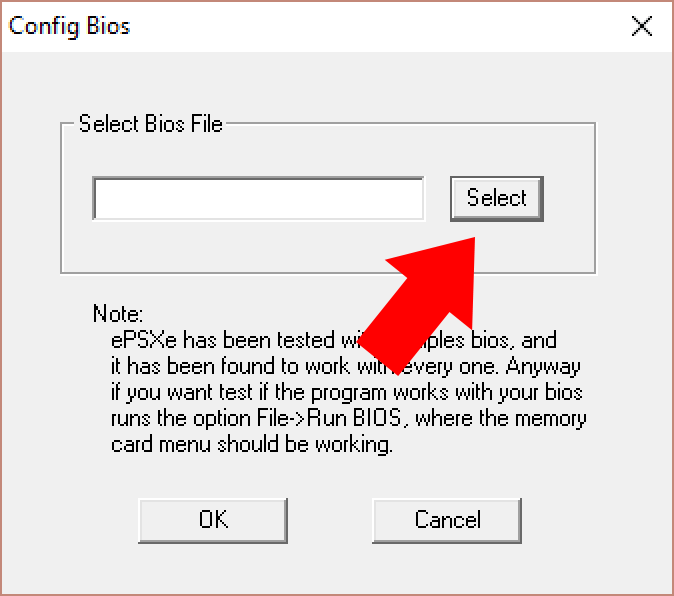 The “Select PSX BIOS” window pops up. You'll see “Scph1001.bin” (the PlayStation 1 BIOS file). Click on it, then click Open, as shown here . That's it! 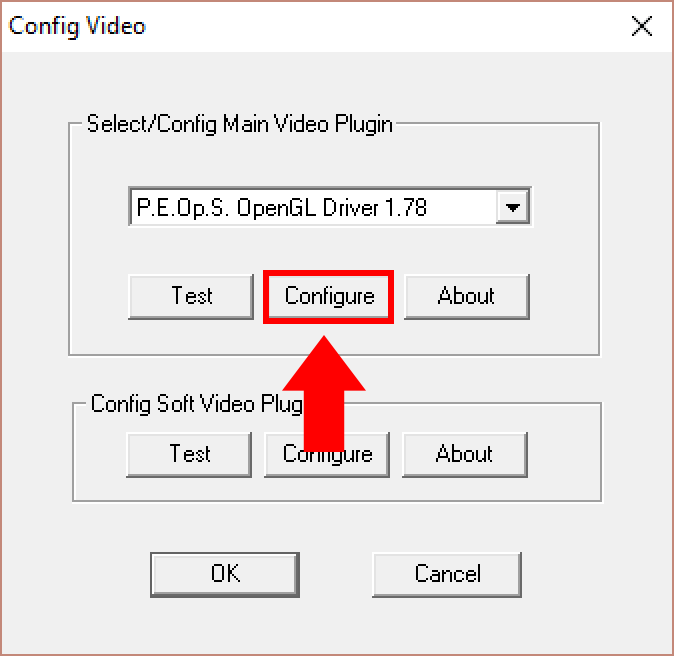 In the “Config Bios” window click OK.
Go to Config > Plugins > Video, as shown here. You'll arrive at the “Config Video” window. Click on the drop-down selection under “Select/Config Main Video plug-in”. Then select P.E.Op.S. OpenGL Driver, as shown here . Later you can play around with the other plug-ins, but for now, I recommend Pete's OpenGL Driver. It's the best and most compatible. Next, we need to configure the plug-in. Click on the Configure button below it - this one . The “Configure Pete's PSX OpenGL Renderer” window pops up. As you can see there are many options here, and it can be intimidating to look at this for the first time. Fortunately, you don't need to bother with any of it. All you need to do is click on the Nice button, then click OK, as shown here. That's it! In the “Config Video” window click OK.
Go to Config > Plugins > Sound, as shown here . You'll arrive at the “Config Sound” window. Click on the drop-down selection under “Select Sound plug-in”. 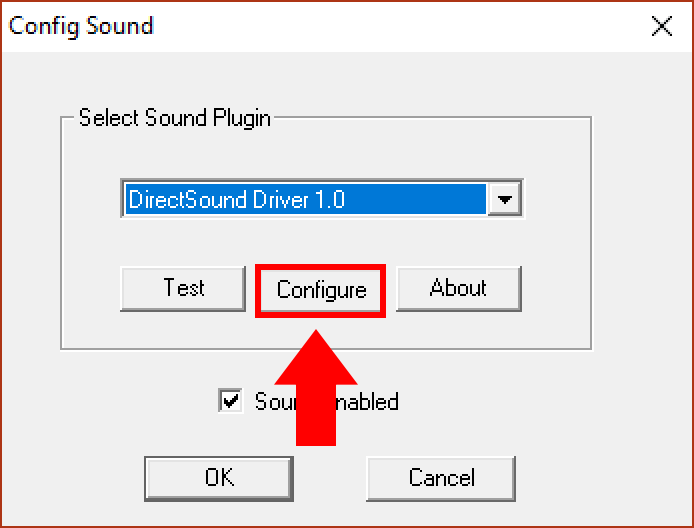 Then select DirectSound Driver, as shown here . If you're using a slower/older computer, Eternal SPU might run better for you than DirectSound. In the configuration window, look in General settings > Mode. 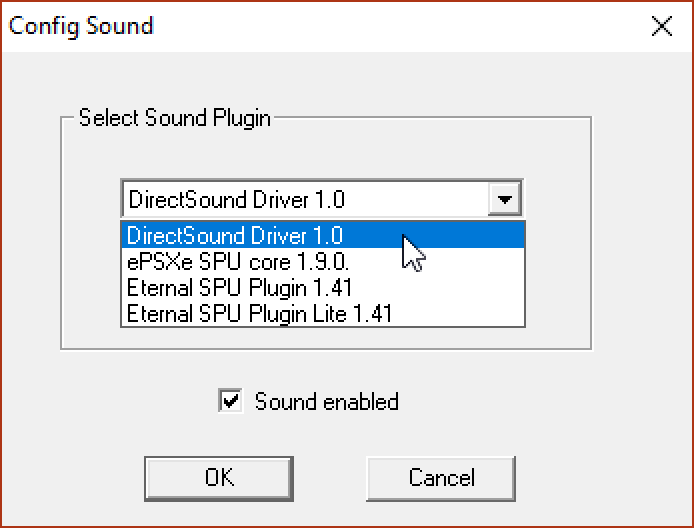 By default, the DirectSound plug-in is set to “Use SPUasync (must be supported by the emu)”. 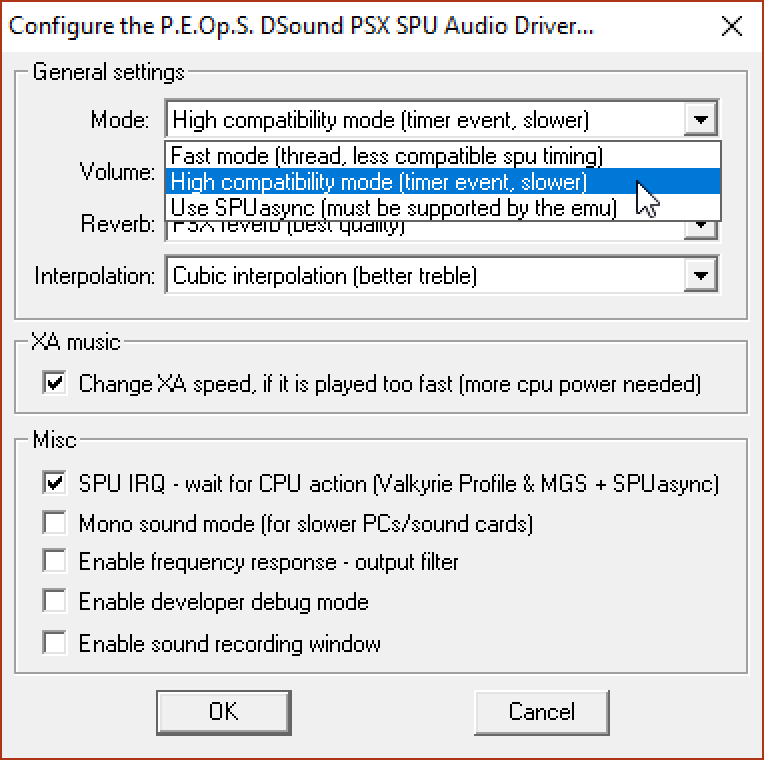 This SPUasync option is a CPU hog and will most likely result in poor quality scratchy audio. 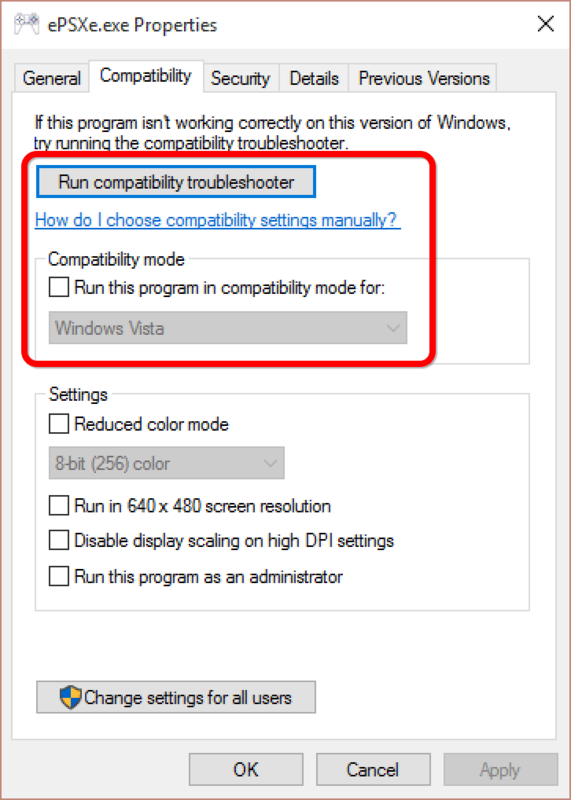 That's easily remedied by selecting High compatibility mode instead, as shown here. 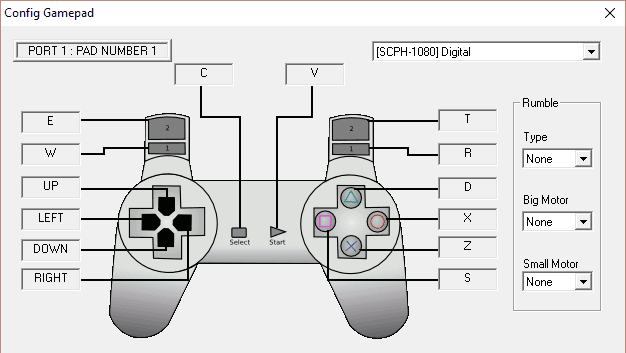 Click on Config > GamePads > Port 1 > Pad 1, as shown here . You'll arrive at the “Config Gamepad” window for the primary controller. This window tells you which keyboard key is associated with which button on the PlayStation 1 controller. As indicated in this screen shot , click on the field for the button you want to reconfigure. Then press the keyboard key or gamepad button you want it changed to. Repeat the process until all desired buttons are customized. Click OK when you're done. *If ePSXe isn't detecting your keyboard, restart your computer and try again. Downloaded PlayStation 1 ISO's typically come in a ZIP, RAR, 7Z, or ECM file. The first step is to extract it. To extract a RAR or 7Z file you can use 7-Zip (it's free). To extract an ECM file watch this video. Using 7-Zip is easy. Just right-click the RAR or 7Z file and go to 7-Zip > Extract Here, as shown here . If the PSX game you downloaded came in a weird format such as NRG, IMG, UIF, DAA, CDI, XBX, B51, BWI, etc. - they are not supported. I recommend trying to find your game(s) in ISO or BIN format. 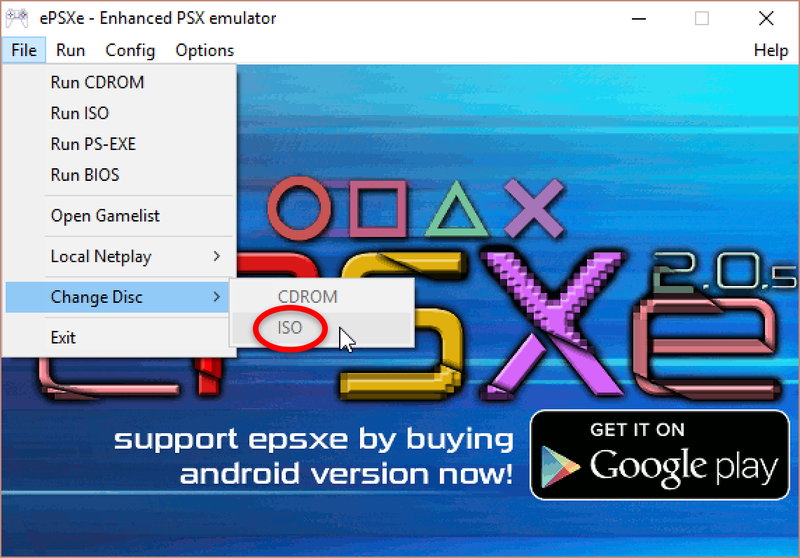 Or, you could try using ePSXe's competing emulator, pSX, because it supports all ISO formats. Go to File > Run ISO. Look through your computer for your ISO and load it as if you were loading a ROM. That's it! The game may not load immediately so give it a minute or two. Refer to troubleshooting if you're having problems. Firstly, I do not recommend using real PlayStation 1 game CDs with ePSXe (or any other PSX emulator). The process is prone to have problems and you will experience slow loading times. Rather, what I do recommend is ripping your PlayStation 1 game to a “BIN/CUE” ISO. There is plenty of space on your hard drive for it. Plus it's good to have a digital backup of your game, just in case your physical copy gets lost or broken. The CDR plug-in needs to be set. If you downloaded my plug-ins collection it includes a CDR plug-on. The “Setting up BIOS, video, & audio” section of this guide explains how to setup a plug-in. You just go to Config > Cdrom and select the CDR plug-in. To load a game: insert the game CD into your CD-ROM drive. 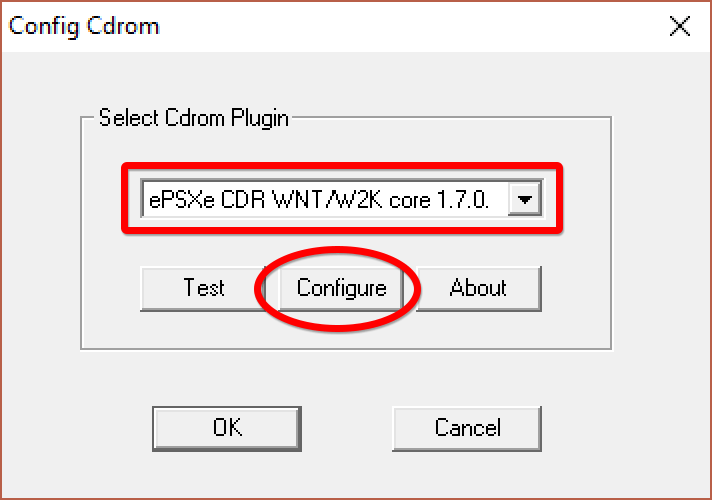 In ePSXe go to File & Run CDROM. That's it! Oh, and don't expect the game to load immediately; give it a minute or two. Upon loading any game in ePSXe, you might get just a black screen. There are a few troubleshooting methods you can try to resolve this. Games don't always load instantly. Sometimes you have to wait a minute for it to come up. Still get a black screen? Try the next attempt. The latest version of ePSXe is known to have black screen issues. You can fix this by going to Options > CPU overclocking > x1. Still get a black screen? Try the next attempt. It could be the video plug-in. Try a different video plug-in, or try different settings with your current video plug-in. Still get a black screen? Try the next attempt. Do this step if ePSXe once worked, but now all games are giving the black screen. So deleting ePSXe from the Registry Editor might fix the black screen problem. This won't mess anything up on your computer. All that this process does is revert ePSXe back to default. 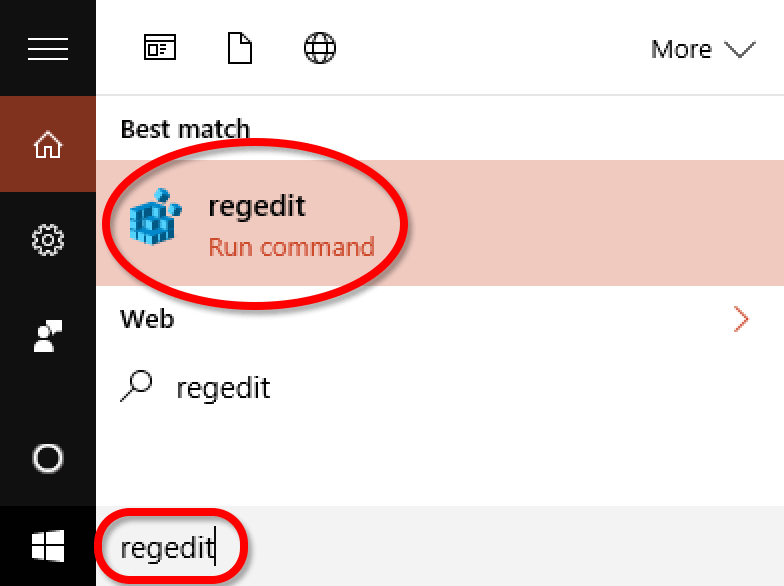 On Windows 10, in “Search the web and Windows” type “regedit” and click on regedit, as shown here . On older versions of Windows, click on Start > Run, type “regedit”, and press Enter. 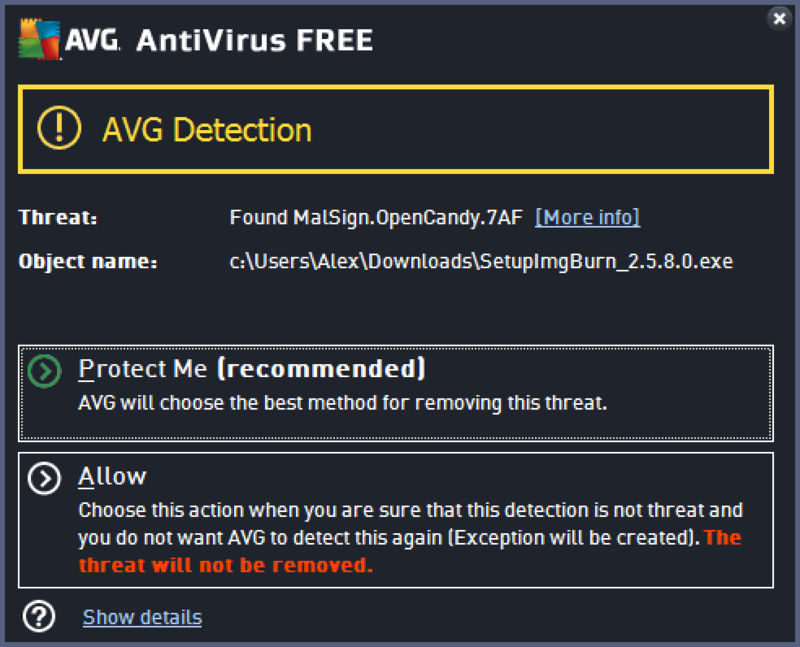 You'll be prompted with “Do you want this app to make changes to your PC?”. Click Yes. In regedit, click the notch next to SOFTWARE to expand it. Under it, look for “epsxe”. Right-click it and click Delete, as shown here . 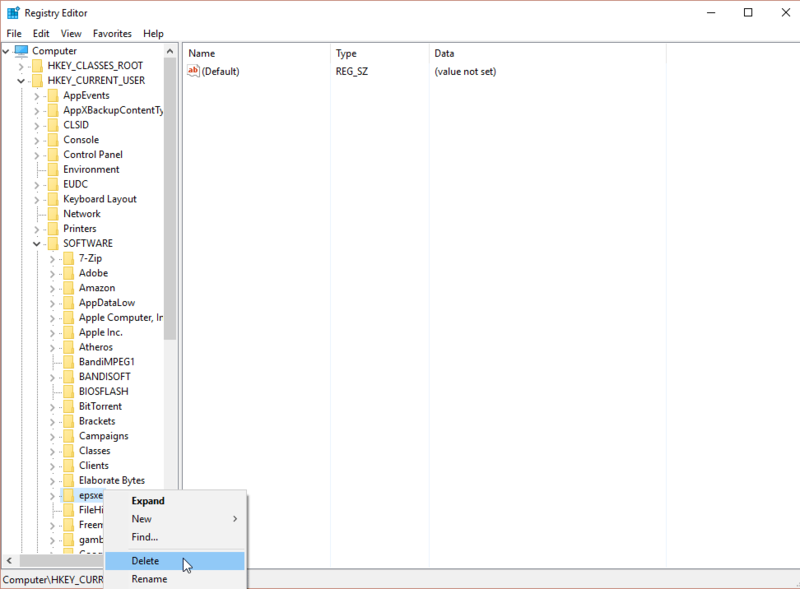 Close Registry Editor and restart ePSXe. You’ll need to set all the plug-ins up again. Make sure the file format of your game is BIN or ISO. If it's not in those file formats, then that's why it's not working. I talk more about this here. If the game is in a ZIP, RAR, or 7Z archive, you must extract it before playing. I talk more about this here. Still getting the error? It would seem your game (your ISO) is corrupt. There are a number of reasons that could have caused this. The most likely reason is maybe it didn't download completely. Try downloading the game again or download it from another website. If you have a game running, you need to close ePSXe and re-open it. Go to Config > Video. Click OK. Go ahead and run a game, and it will now open in full screen. Wait until the game asks you to swap CDs. Press Esc to return to the ePSXe window. Go to File > Change Disc. From here select ISO (as shown here ) for an ISO (or BIN) or CDROM (as shown here ) for a physical CD. Then follow the prompts. These days we have 1 TB hard drives, mobile devices, and laptops without a CD-ROM drive. All such devices are reasons for you to rip your PlayStation 1 games (if you refuse to download them from a ROM site). PSX games also run better & faster via ISO, as opposed to playing them via a CD-ROM drive. The following directions will show you how to rip your game CD. Specifically, it'll be ripped to “BIN/CUE”. It's a common type of ISO format. 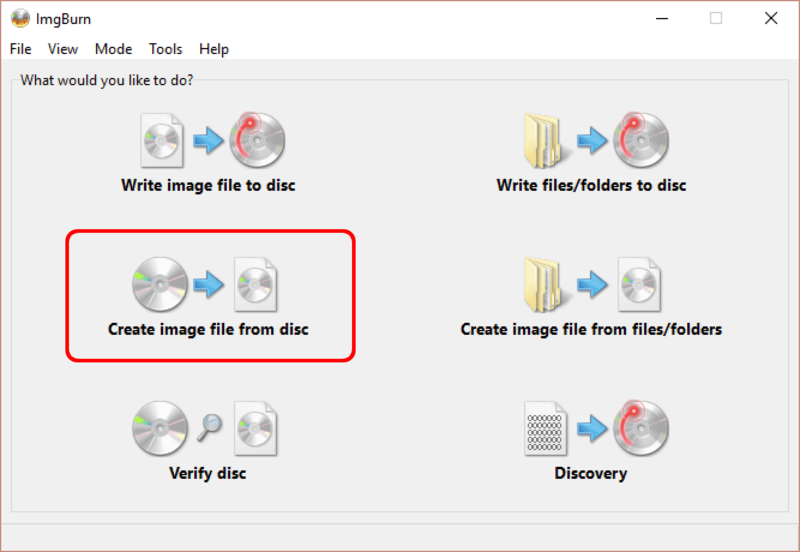 Upon opening ImgBurn, click Create image file from disc, as shown here . Make sure the proper source drive is set in “Source”, then click the Read icon - as shown here . That's it! Ripping your game CD will take maybe 20-30 minutes. By default, ImgBurn will toss the BIN file (the ISO) into Documents. Press the Esc key to pause the game. Doing so will make the screen disappear and exit to your desktop (with the ePSXe window still there). But don't fret! The game is paused and still running in the background. To continue the game, click on the Run menu then Continue. If you accidentally close the ePSXe window, then your progress is lost. Save states is a feature that saves the exact spot you are in any game. You can use this feature manually by going into the Run menu or by quick keyboard shortcuts. Capturing a state: To capture a save state go to Run > Save State and choose any of the 5 slots. These slots are reserved to allow you to save up to 5 different save states. Upon selecting a save slot, ePSXe will immediately return to the game. The keyboard shortcut for saving states is F1 to save in Slot 1. Loading a state: To load a state you previously saved, go to Run > Load State and choose the slot where your save resides. The keyboard shortcut for loading saves is F3 to load from Slot 1. Note: ePSxe's save state feature is slightly glitchy. It has a history of not working well when you save during FMVs or instances of heavy activity. It's best to capture a save state at a point when the game is at a standstill with nothing going on. Pro tip: If you're playing a game that has in-game saving (such as an RPG) I recommend that you use both save states and in-game saving to save your games. That way you'll always have a backup. To manage your memory card and copy/move/delete saves are the same exact way as you do on the real thing. The following directions will guide you to the memory card management screen. Go to File > Run BIOS, as shown here . Note: If you get a “cdrom not found” error, read below. You should arrive at the BIOS main screen . Choose Memory Card to proceed. 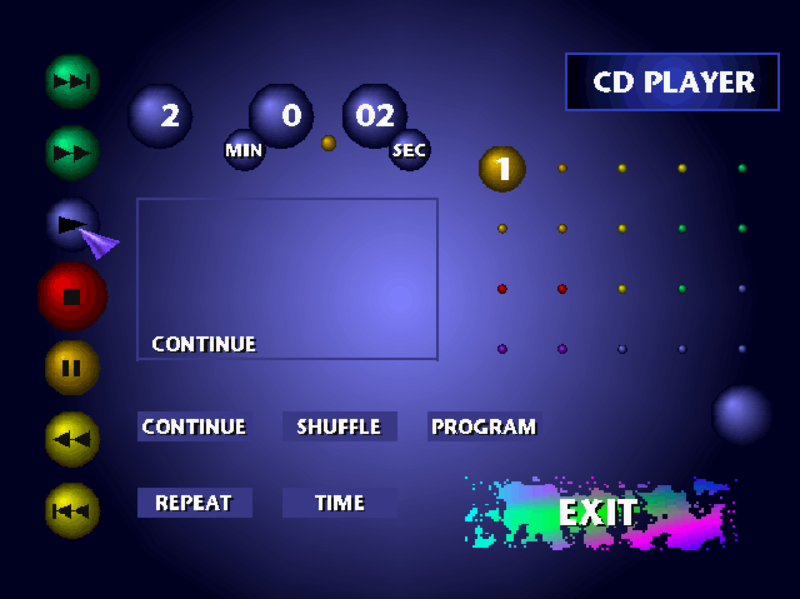 *If ePSXe took you to the CD Player instead, navigate the cursor to Exit to return to the main screen. 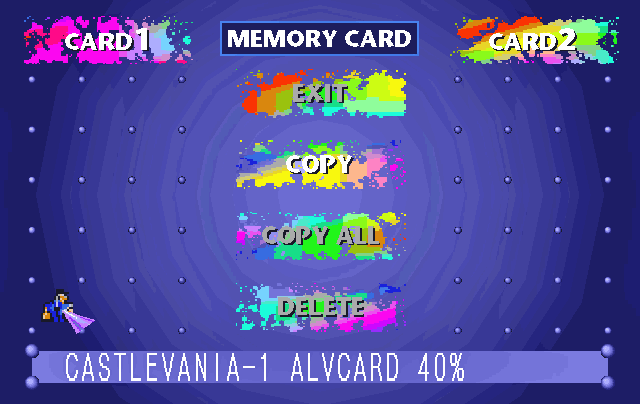 This is the screen where you can manage your memory card saves. You would do so exactly as you would on the real PlayStation 1 system. Download & install Virtual CloneDrive (it's free!). Look on the bottom right of your screen for a new icon that looks like this: . 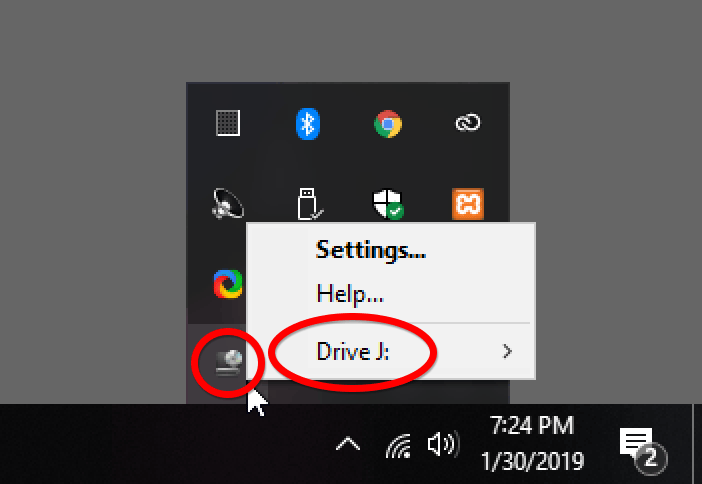 Right-click it and look to see what drive letter Windows set Virtual CloneDrive to, as shown here . In my sample picture, the drive letter is “J”. Open ePSXe. Go to Config > Plugins > Cdrom. You'll arrive here . In the drop-down field, select a CDR plug-in. It doesn't matter which one. Then click on the Configure button. You'll arrive here . In the drop-down field, select the drive letter associated with Virtual CloneDrive. Click OK. Finally, now try loading the BIOS again. Go to File > Run BIOS. It should be working now. Press Delete to show the “FPS menu” of Pete's video plug-in (picture below). Notice the arrow is on the “FL” icon. It must be there to continue with these steps. Press the End key to enable fast forward. By doing so, you will see the icon change to this: . To bring the game back to normal speed, press the End key. You will see the icon change to this: . Press the End key a second time to change the icon back to it's original state: . When you're done you can hide the FPS menu by pressing the Delete key. To re-enable fast forward, repeat these directions. If fast forward isn't fast forwarding, switch to Pete's Soft plug-in. Figuring out how to add your own Game Shark cheats from scratch could take 10 or so minutes. You can read this guide if you really want to know how. But I have something even better for you! 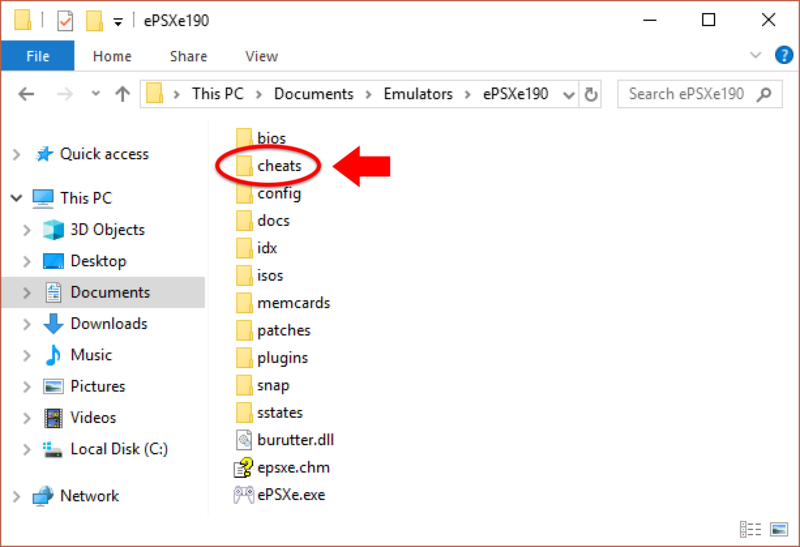 Just download the zip file below that already has every cheat prepared for ePSXe. ePSXe Cheats Pack (1.67 MB) - the official cheats pack which contains Game Shark cheats for every PlayStation 1 game. 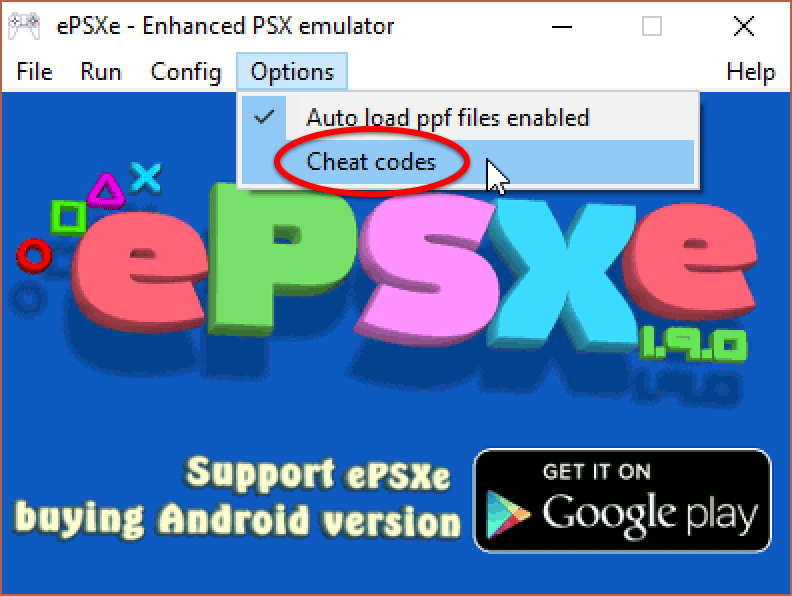 Download the above cheats zip file and extract its contents into ePSXe's cheats folder . Open ePSXe and run the game you want to cheat with. Make sure the game loads successfully. Next, go to Options > Cheat codes - as shown here . You'll arrive at the Cheat Codes window . In “Cheat Codes Available” you should see a list of cheats. Click on the cheat(s) you want to add, then click the Enable button. Or just click Enable All. When you're done, click on the OK button. That's it! The cheats should be active and running. Even though ePSXe is the #1 PlayStation 1 emulator, it's not perfect. Maybe the video plug-ins don't like your video card. Maybe the game you downloaded is partially corrupt. Maybe the game you're playing is obscure and not fully supported. Popular games do get more attention to run better. There could be many reasons why you're having problems. 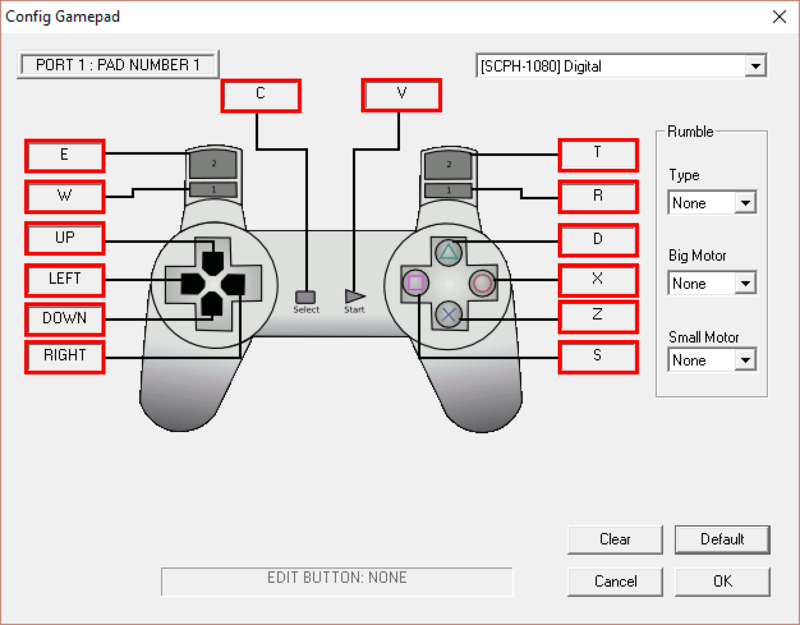 Keep reading for general tips on how to troubleshoot problems with ePSXe. If something is messing up VISUALLY: I suggest you play around with the settings in the video plug-in's configuration, or try another video plug-in. Also, make use of specific game fixes within the configuration. Particularly, when using Pete's plug-ins it helps to switch between the Fast and Nice presets. Playing with them can resolve speed issues or graphic glitches. If something is messing up with SOUND: I suggest you play around with the settings in the sound plug-in's configuration or try another sound plug-in. That's basically the plan of action when something goes wrong. You try other configuration options or try another plug-in. For more help scroll down to the FAQ “Q:” questions. In my links page, I have some good links to sites where you can download PlayStation 1 ISOs. If you want to try to find more sites than what's in my collection of links, just Google around. For example, if you want to download Final Fantasy VII just Google “download final fantasy vii psx”. Your video card doesn't like the video plug-in you're using. If this is the case, switching to another video plug-in should resolve this problem. The last time this tutorial was updated, version 2.0.5 was the latest version of ePSXe. That version of ePSXe could be causing this issue. 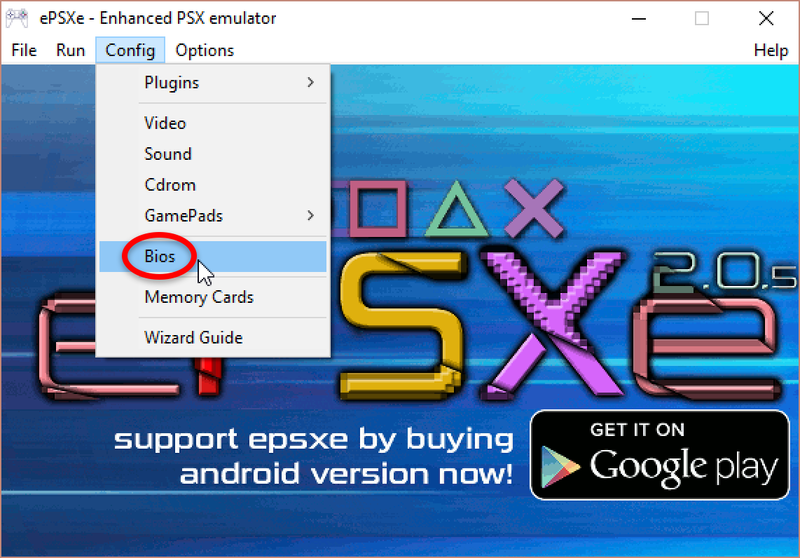 Go to my emulators page and download ePSXe version 1.9.0. If 2.0.5 was the problem then using 1.9.0 will resolve it. If the 'stopped working' errors continue even if you roll back to 1.9.0, try different video plug-ins (as suggested in reason #1). Ha, that's a good problem! This simply means your computer is too fast for the current settings of the video plug-in. To resolve this just beef up the settings. Doing so is easy. Go to Config > Video > Configure. If you're using one of Pete's plug-ins (which I hope you are) all you need to do is click on the Nice button. 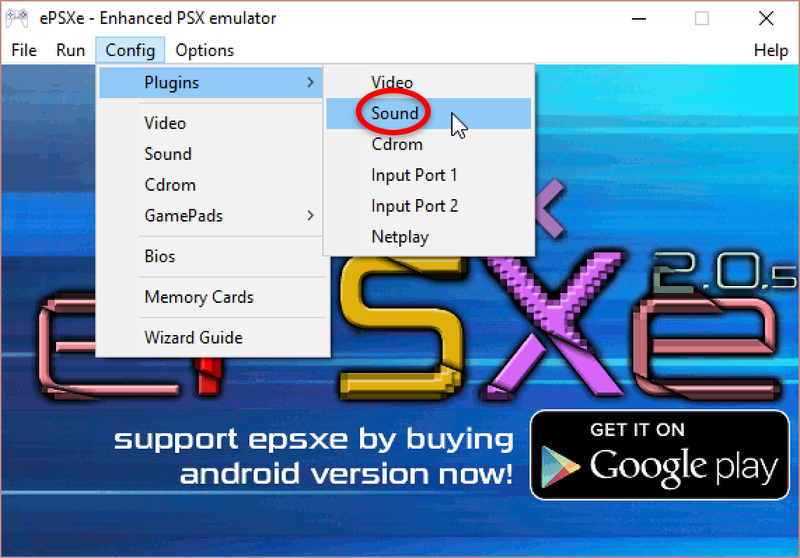 Q: When I close ePSXe it doesn't close completely and I can still hear it! So every time you close ePSXe, it closes the ePSXe window but you can still hear your game and its music in the background? This is slowly becoming a more common issue with new computers. ePSXe hasn't been updated since 2013. There's not a fix for this. 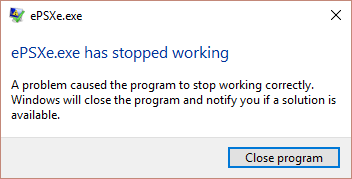 Every time this happens you need to go into Windows Task Manager and force close the ePSXe process. Watch this video for directions on how to force close a process. That's a common error with ePSXe v1.70. You can download that zlib.dll file here (it's 31.9 KB). 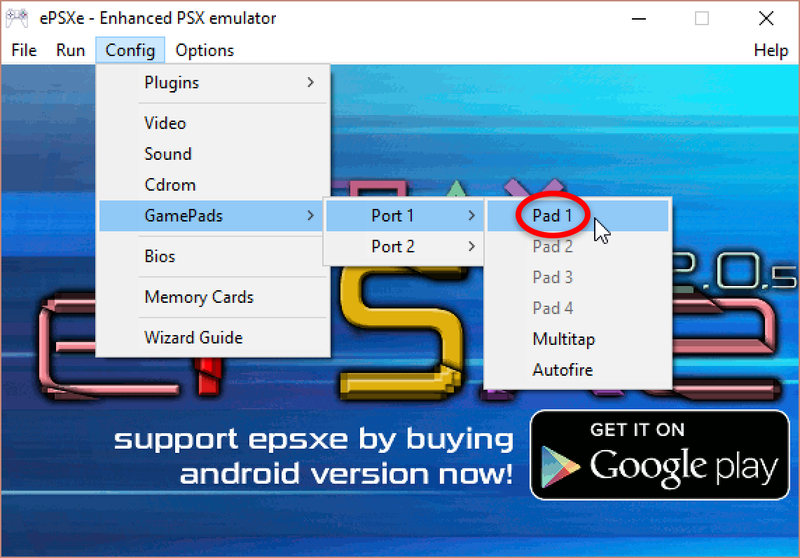 Extract it from its zip file and copy it over to the folder that you have ePSXe in. I bet you grabbed that save from GameFAQs. GameFAQs offers a wealth of PlayStation 1 saves, but they're all in GME format. Can you use them with ePSXe? Yes, you can! How? Just rename it. Take note how ePSXe organizes its memory cards. First decide if you want the GME file to replace memory card 1 or memory card 2. To replace memory card 1, rename your GME to “epsxe000.mcr”. To replace memory card 2, rename your GME to “epsxe001.mcr”. Then move this file over to ePSXe's memcards folder. Also, don't forget that saves are region specific. For example, a save from a European game won't work on a North American game. Right-click ePSXe.exe and left-click Properties. Click on the Compatibility tab. You will end up here . Here's the tricky part. I can't tell you what to do here because every video card is different. You can start by clicking Run compatibility troubleshooter and follow the wizard. Try “Try recommended settings” first. If that doesn't fix it, try “Troubleshoot program”. 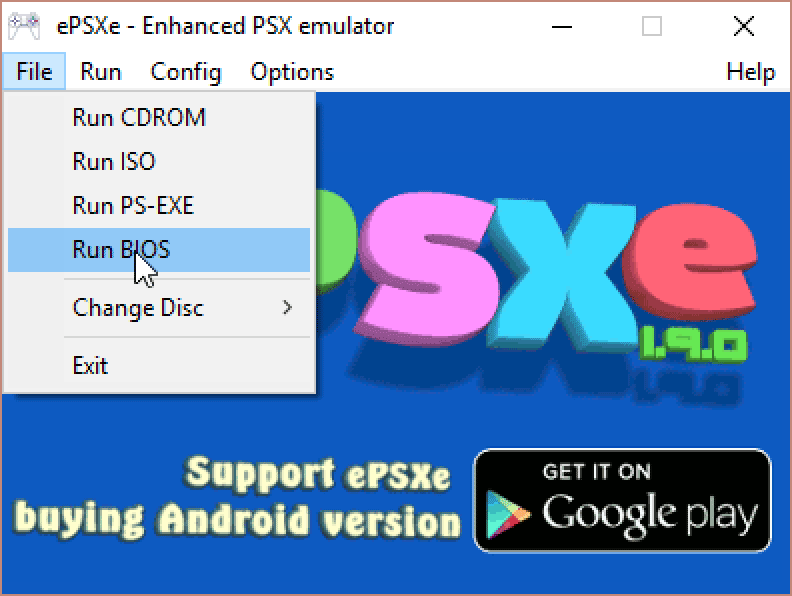 You could also try running ePSXe in compatibility mode under Windows 8 & older under “Run this program in compatibility mode for”. Probably Windows 7 or (even older) Windows XP is your best bet. Lastly, there's a small annoyance that might happen upon setting ePSXe to emulate under an older version of Windows. From now on, every time you open it you might be prompted by this message: “Do you want to allow the following program from an unknown publisher to make changes to this computer?”. Every time you will have to choose to accept that message. Yes! For example, I've successfully transferred my memory card file to a PSX emulator on Android smartphones. It's easy. All that you do is copy over ePSXe's memory card file to the memory card folder of the other PSX emulator. Then rename your memory card file to the naming convention of the other PSX emulator. 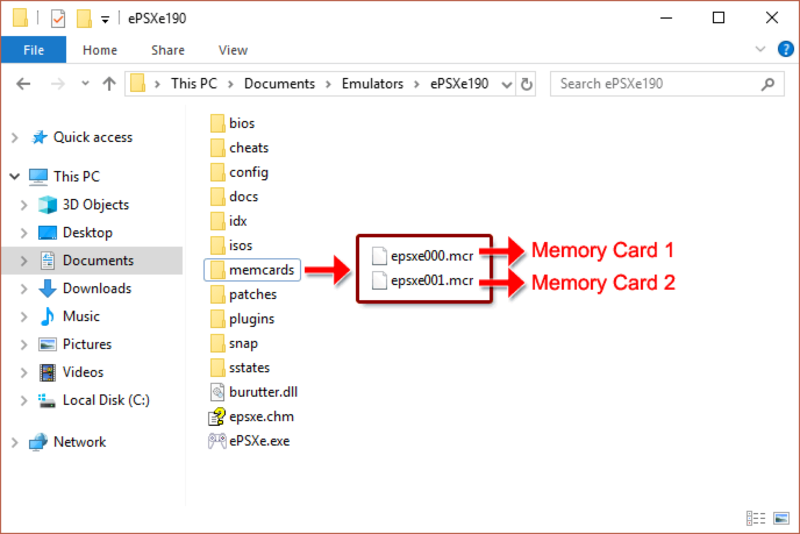 ePSXe's memory card file is located in the “memcards” folder - as shown here . So “epsxe000.mcr” is memory card 1 and “epsxe001.mcr” is memory card 2. 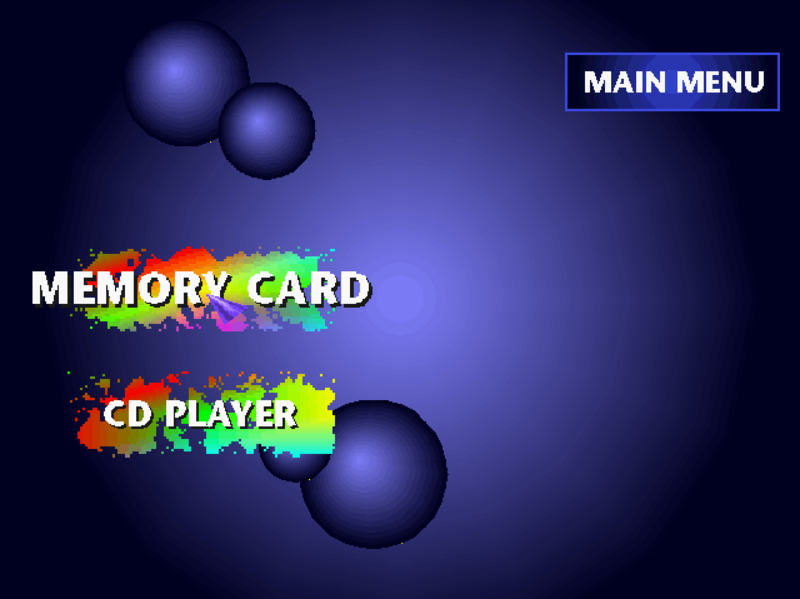 So let's say the other PSX emulator calls its memory card file “memcard1.mcr”. Just rename “epsxe000.mcr” to that same filename. You can learn more about transferring saves in my Game Saves Tutorial. 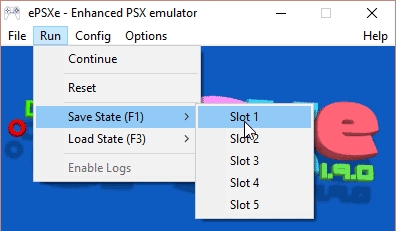 Note: You cannot transfer ePSXe save states to another PSX emulator. Only MCR memory card files can be transferred. When you save your game at a save point and close/re-open ePSXe, you find that the save is lost. Plug-in configurations that you changed aren't saved. When you close/re-open ePSXe, you have to make those configuration changes again. Then your problem is that you currently have ePSXe in a read-only location on your computer. You must move ePSXe to a more common location such as Documents, Downloads, or a folder on your desktop.